Among hydraulic systems, vacuum compression moulding presses are among the most demanded. 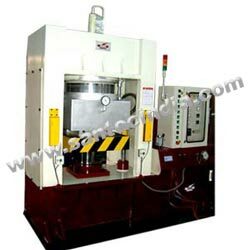 These presses are used to process rubber, silicone as well as composite materials. Vacuum moulding machines are used for precision components. These hydraulically operated automatic machines find wide applications in the production of precision moulded rubber components where reliable and quality are the keywords. In these presses, multi-cavity moulds are used with maximum three plates-design. Vacuum compression moulding presses have some advantageous features. The machines are compact and designed for minimum maintenance and ease of operation. Temperature of the platens is critically controlled with PID type temperature controllers. Apart from this, these machines have a host of constructional features. As for example, these machines consist of two sections, one part is vacuum moulding press and second one is automatic mould ejection system. Both the systems are connected with automatic mould handling arrangement, sequenced with press operation. Vacuum compression moulding presses are also available with die sliding or ejector arrangement and tilting of upper platen for easier access. The moulds coming out before opening make it easy for the operator to remove the finished product and reloading for the next cycle of operation. All movements are driven hydraulically and controlled by PLC (programmable logic controllers).